Today I received this information from Keith A. Fontenot, County Agent, Evangeline Parish. I am not on the program to speak at this meeting, but I will be there to distribute our annual rice entomology survey and to answer any questions you might have about pest management in your rice crop. Wednesday, January 4, 2012– Registration at 7:30 a.m.
Two of Evangeline & St. Landry Parish’s most economically important crops will be discussed at length at the 52nd Annual Rice Production School and 45th Annual Soybean Production School. These production schools will be held together on Wednesday, January 4 with registration beginning at 7:30 a.m. at the Ville Platte Civic Center. Topics to be discussed by specialists and researchers with the LSU Agricultural Center will center on updated production practices concerning both crops. Recertification is also offered on this day to all producers or homeowners needing recertification of their Private Pesticide Applicators Card. If you register, pay the $25.00 fee and attend the entire meeting, you will be recertified as a private pesticide applicator for another 3 year period. These private applicator re-certification meetings will also be offered in February. At the meetings in February you will only be required to stay 1 ½ hours to be re-certified. G & H Seed Co. The LSU AgCenter prohibits discrimination in all its programs and activities on the basis of race, color, national origin, gender, religion, age, disabilities, political beliefs, sexual orientation, and marital or family status. Persons with disabilities, who require alternative means for communication of program information or other assistance, should contact the Evangeline Parish Office of the LSU AgCenter at (337) 363-5646. It is the policy of the Louisiana Cooperative Extension Service that no person shall be subjected to discrimination on the grounds of race, color, national origin, gender, religion, age, or disability. If you have a disability that requires special assistance or accommodation for your participation in the program, please contact Rob Ferguson, LSU AgCenter, at 318-964-2245 by January 9, 2012. NOTE: ATTENDANCE OF THE ENTIRE MEETING IS REQUIRED IN ORDER TO BE RECERTIFIED! As you may recall, we received approval for a Section 18 registration for Tenchu 20SG to control rice stink bug in Louisiana rice. This approval came very late in the season when most of the southern crop was either harvested, or well on it’s way to harvest. Fortunately, we were able to work with a team of county agents to line up some field locations and compare the efficacy of Tenchu 20SG to pyrethroid treatments. Here is a brief report of what we learned. 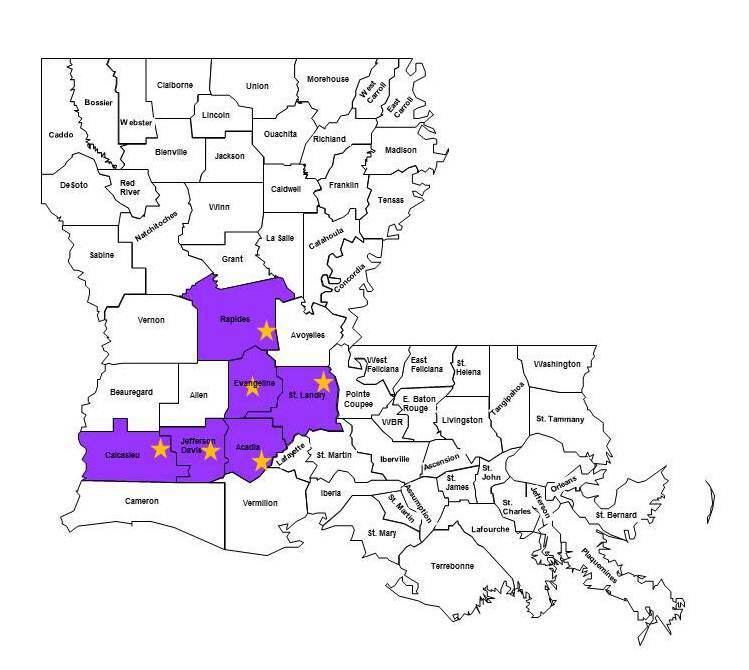 Nine field sites across Louisiana were identified for participation in the demonstration program. At all locations two adjacent fields or cuts were sprayed separately with a pyrethroid or Tenchu 20SG. Sweep net samples were taken within 24 to 48 hours prior to spraying at each site between the growth stages of anthesis and hard dough. Insecticides were applied by aerial applicators at recommended rates for both products: 8 oz/ac of Tenchu 20 SG, 2 oz/ac of Karate, and 4 oz of Mustang Max. Additional sweep net counts were taken at 48 hours and 7 days after treatment to determine residual effects of either treatment against infestation of RSB. The pyrethroid portion of one field site remained above threshold at the 48 hour sampling point and was treated with a second application at 48 hours to prevent further damage. 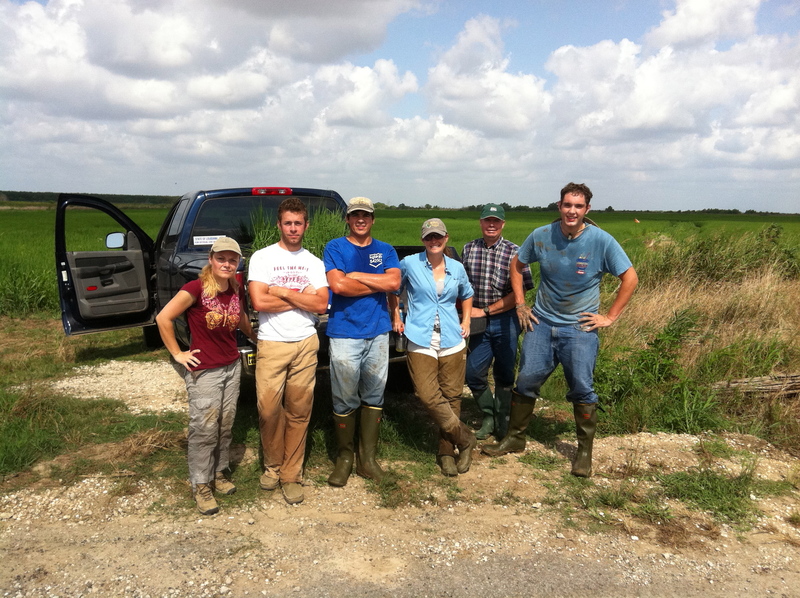 Samples of rough rice were collected from all treated sites at harvest and analyzed by a USDA certified inspector at Bertrand Rice in Elton, LA to determine percent pecky rice and determine the USDA grade of the sample. We analysed the data in SAS using a Proc Mixed Procedure. The average number of RSB per 10 sweeps was not significantly different when analyzed by treatment or time. There was no significant difference in the percentage of peck between treatments, and no grade reductions were applied to any samples gathered. Thus, we concluded that either Tenchu 20SG or pyrethroids, when applied appropriately, both provided good control of RSB and prevented grade reductions due to peck in our demonstration test. We are continuing to conduct research on rice stink bug thresholds and treatment strategies. I’ll talk about these results at the winter production meetings in 2012. We will also present these results in a poster at the Rice Technical Working Group meeting in 2012. Special thanks to all our demonstration cooperators: Floyd Baker, David Bertrand, Keith Collins, Richard Costello, Chris & Randy Dauzat, Barrett Courville, Rusty Elston, Terry Erwin, Eddie Eskew, Rob Ferguson, Noble Guedon, Michael Hensgens, Nan Huff, Ron Landis, Mitchell Leger, Cecil Parker and Larry White. This project was coordinated by Bryce Blackman, Mike Stout, Anna Meszaros and myself.